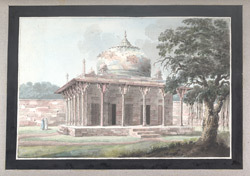 Watercolour of the Nadan Mahal in Lucknow, Uttar Pradesh part of the Wellesley Albums, by an anonymous artist working in the Calcutta style in c. 1798-1804. The Marquis of Wellesley was Governor General of India from 1798 to 1805. In that time he amassed a large collection of art, consisting mainly of natural history drawings. This is a view of the Nadan Mahal, the tomb of Shaikh 'Abd al-Rahim of Lucknow, friend to Akbar. The tomb is complete with most its tile work and four corner cupolas, which were subsequently destroyed and not replaced.